This is another of my Anna's Veranda pix. I set this glass of tea down on the window sill, and thought to myself, "that could be a painting". The glass has such a great shape. I love the facets, and the flared top. If you'd like to bid you can access the auction by clicking here. 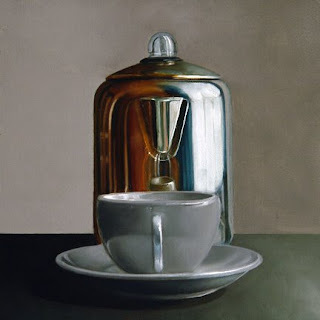 I've had this little percolator for a few years now, and it's one of my favorite things to paint. It doesn't produce a mirror image of the room like some of my other appliances, but it does create wonderful patterns of color in its' surface. 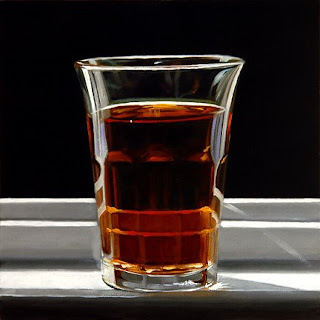 I enjoy pairing that material with the subtle variety of light and shadow in the cup. It's a recurrent theme in my work, and I hope to continue to use it well into the future. If you'd like to take part in the auction, you can bid by clicking here. Back in February Karen, and I spent a few days at Inlet Beach Florida. Karen had discovered a beautifully restored Victorian home for rent right on the beach over the internet. 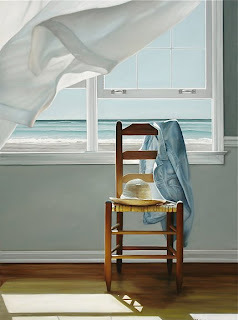 The house was called Anna's Veranda (hence the title), and she wanted to use it as subject matter for new paintings. My primary job was to be her assistant, and tech support. Busy as I was, I did manage to find some time to do a little photography for myself. When I noticed this doorknob on one of the bedroom doors, I couldn't resist taking a couple of shots. 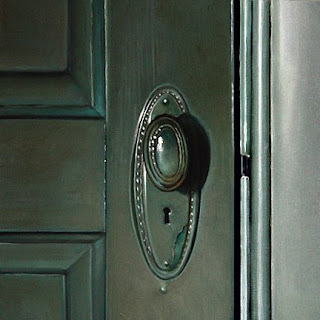 I loved the shape of the knob, and the detail on the escutcheon plate with its' keyhole, and chipped paint. I thought this close crop, combining the knob with a small section of the multiple recessed panels, made a nice composition. If you'd like to bid on the painting you can take part in the auction by clicking here. I shipped out all four paintings for the Chicago commission this morning. It's always an anxious time when I have to entrust the safety of my work to an independent agency, i.e. FedEx. I've been lucky so far in my art career, in that I haven't had any of my paintings, lost or damaged in transit. Nonetheless, I still tend to worry until I hear that they've arrived in tact. I've been spending a lot of time since the completion of the commission working on my website. It hasn't had a significant update in well over a year, and I thought it was time to do some renovating. I eliminated a lot of pieces, then researched my archives for some older overlooked, but worthy, paintings to replace them with. In addition to those, I've added many new paintings completed within the last year. I've also reworked the layout, and overall design of the site. Hopefully, this will enhance the presentation of the paintings, and make the site easier to navigate. It will be a week or more, until it's finally ready to publish. The site is huge. I had never counted the number of pages before, but during this update out of curiosity I did, and found it to be over 250 pages. Thank goodness for Apple's iWeb, it makes the process very easy. Anyway, when it's actually up, I'll mention it in a future post, with a link for those who haven't been there. I've also been working on some new ebay paintings. 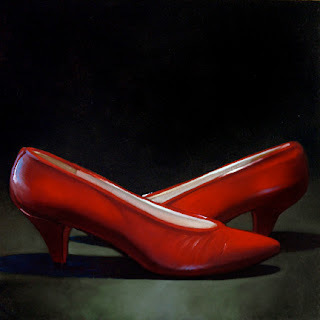 Red Crossed Shoes will be the first of five going up this week. Once all of these are set in motion, I'll be getting back to work on some larger paintings for the galleries. If you'd like to bid on the painting above, you can access the auction by clicking here. Well, the Chicago commission is complete. 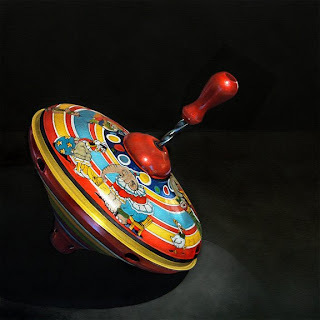 The fourth painting representing the theme of "play", is in the drying phase prior to varnish. These have to be in the hands of the client by the end of the month so that final process will have to be expedited. I hope that when these are unpacked the client is pleased with the work. Now it's on to some ebay paintings, then it's back to work for the galleries. It's been a long time since I've shown them, "any love". I'll have to work hard, and fast to make it up to them. 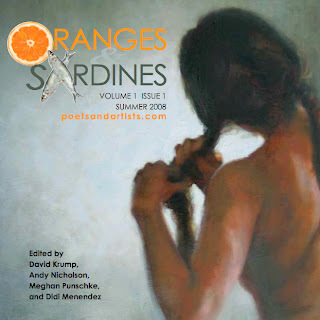 Karen is one of the featured artists in the April 2009 issue of Oranges & Sardines Magazine. This is a quarterly publication offered online, or you can purchase a hard copy at either Amazon.com, or createspace.com. Content for the magazine is centered around poetry, and the visual arts. Didi Menendez, one of the editors at the magazine contacted Karen, and interviewed her for the article. It provides an interesting insight into Karen's creative process. In addition to the Q&A, the article includes four, full page, images of her work, including Deep Breathing, above. 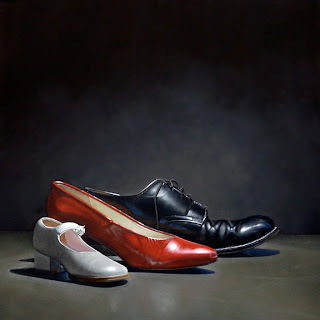 If you'd like to read the article online, and view the other featured paintings, you can visit the magazines website at: poetsandartists.com. Karen was also interviewd by Jeff Hayes for a new feature he's begun on his blog. It's a monthly in depth interview with other artists. Her interview was posted last night, and can be read by clicking this State of the Art link. I was one of the featured artists in the first edition of O&S magazine back in the summer of 2008. That article is still archived, and can be read online, by clicking here. I'm nearing the finish line with the Chicago commission. I'll probably have the fourth painting completed within the next couple of days. I'll post an image as soon as it's done. It's the smallest of the four, but one of the more complicated to paint. It's been a real challenge, but if it works, I may use this same subject for future gallery paintings. Here is the third of four commissioned paintings headed to Chicago. The title/theme of this painting is, "family". I had come up with a number of ideas while contemplating this theme, but it was Karen's suggestion of using shoes that finally made the cut. It was an inspired idea. The "fathers" shoe, in back, was issued to me at Lackland Air Force Base on November 17, 1972. They were part of my dress blues, and I still wear them today as my dress shoes. The rest of the family came from the Goodwill. A great place to find props. I love the combination of the black, white and red. Now I'm into the final piece, titled Play. It's a complicated one, but if it works out like I hope, I think it will look pretty cool.